In terms of design, educational facilities are evolving. Gone are the days of dimly lit campuses. Today’s school designers are incorporating more windows to enhance the building’s efficiency, increase day lighting and maximize the aesthetic appeal of the learning environment. Schools have unique design needs. The building itself serves a variety of stakeholders, including students, educators, administration, and facility staff. Plus, schools must be designed for a variety of functions, including academics, community events, and athletics. Ultimately, windows play a significant role in maximizing the functionality of the school. The right window choice can enhance spaces with natural light, making them more conducive to learning or athletics. Windows also maximize efficiency, helping to reduce heating and cooling loads, and windows can help all stakeholders enjoy greater comfort by reducing exterior noise, balancing temperatures, and eliminating draftiness. So what should facilities managers do when choosing windows for a renovation or new construction project? Ultimately, there are several design principles facilities managers should understand, which can help better prepare the school for a renovation or replacement project. Schools that were built in the 1960s and 1970s often feature aging aluminum- or steel-framed windows. These windows, which have typically exceeded their service life, tend to create a number of problems in learning environments, including draftiness, uneven temperatures, and excessive noise transmittance. These problems can be offset by replacing the aging windows. 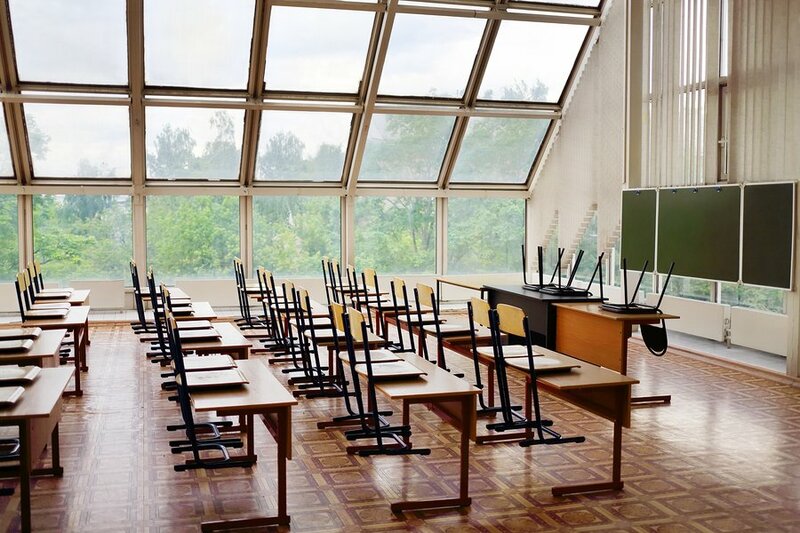 Yet, when selecting replacement windows, school facilities managers should focus on a few key areas – which also apply to new construction schools. One advantage of replacing old, leaky aluminum windows: Schools can reduce HVAC costs significantly. In particular, new commercial windows for schools tend to have a U-Factor in the 0.4 range, meaning they provide substantial insulation. And school windows also tend to have a solar heat gain coefficient of 0.5, meaning they better limit the amount of heat from the sun that’s transmitted through the window. Features like tinted or coated glass and the type of framing material can have an effect on the windows U-Factor and SHGC. Daylighting refers to using windows and interior surfaces to maximize natural light in a space, and it’s a modern design principle used in schools today to transform old, dimly lit spaces. Ultimately, daylighting – which has been shown to improve student performance – is achieved by controlling the amount of light that’s transmitted. Features like between-the-glass blinds, louvers, and awnings, for example, help to manage the flow of light. Another benefit: Daylighting can also help schools reduce their electricity costs because the natural light can replace artificial light sources. Classroom comfort refers to many things – temperatures, glares, noise levels, ventilation, etc. In other words, an ideal classroom features the right amount of natural light, temperatures are balanced in all seasons, and playground or street noise is significantly reduced. Windows play a major role in ambient comfort, and there are a variety of features that can help to maximize interior comfort. Window shades – like between-the-glass blinds or awnings – can contribute to control the flow of light. Plus, solar glazing and Low-E glass can help to manage solar heat gain. Many older schools tend to feature outdated window designs. For example, in the 1960s and 1970s, it was believed that fewer windows in classrooms would help to limit energy costs. That, unfortunately, was a false assumption. Fewer windows actually can increase costs, by limiting the amount of solar heat that can passively heat a room. In other words, updating outdated school windows can help to improve natural light, reduce energy costs, and create more hospitable learning environments. Frame expanders – Frame expanders are utilized when some of the windows components, i.e. sash and frame, are in relatively good shape. A frame expander covers deteriorating trim and seals the window. Custom-sized windows – Custom windows of nearly any size can be manufactured to fit any existing window opening. Typically, a complete tear-out is necessary for aesthetic renovations or for structural reasons. Salvaging existing frames – Sometimes, the frame can be recovered and schools can suffice on replacing the window sashes. In this case, custom replacement windows can be ordered that fit into the existing window pocket. Educational facility design principles are changing, and the way that windows are utilized in schools is changing as well. Whether a school renovation or a new construction project, the right windows offer a number of benefits for schools, including improved energy efficiency, enhanced comfort, and increased natural light.